Earth is more fragile than you know. Scientists believe that any of these doomsday events could occur in the near future. 1. The asteroid that killed the dinosaurs returns: Sixty-five million years ago, an immense asteroid struck the Earth, raising clouds of dust that chilled the global climate and wiped out the dinosaurs. Think it couldn’t happen again? 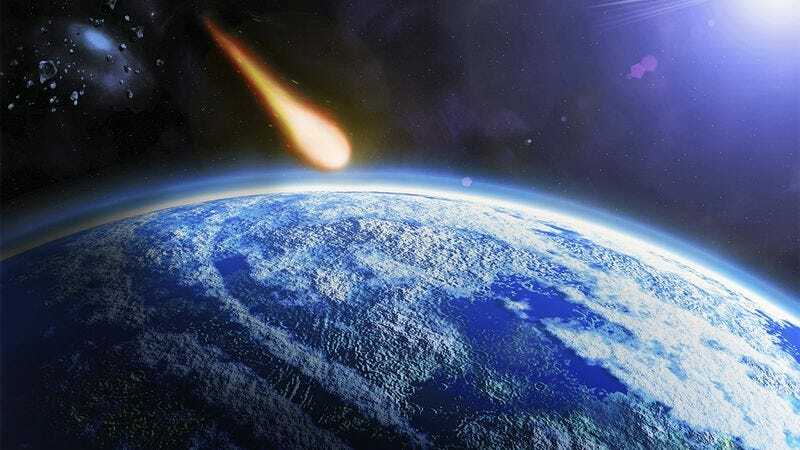 According to astronomers, that rogue asteroid is still lurking in the void of space and could slam into Earth again at any time without warning. 2. Self-replicating nanobots that make the entire world covered with liquid metal like in a vodka commercial: As we pursue ever more advanced nanotechnology, one peril to avoid is the catastrophic “gray goo scenario.” This would be a disaster caused by microscopic machines that consume all matter they touch and turn it into even more nanobots, a chain reaction that would transform the entire world into an ocean of gray, robotic liquid. Scientists believe that this bizarre futuristic landscape would remind humanity of a vodka commercial and cause us to drink vodka nonstop until we all die of alcohol poisoning. 3. Bigger moon: The moon is a beautiful sight in the night sky, but what if it suddenly became much larger? If it grew even 50 percent larger, it could wreak havoc on the tides and cause major flooding around the world. But it gets worse: If the moon kept growing, eventually its gravity would be so strong that people would start flying up into the sky and smashing into the lunar surface at hundreds of miles per hour. Think a parachute would save you? There’s no atmosphere on the moon, so parachutes don’t work there. The grim truth is that if the moon got thousands of times larger, we’d be screwed, no matter how many parachutes we could stockpile. 4. A virus that makes people grow a third arm that constantly flicks under their chin at the Italian Mafia: Airplanes and international trade have brought the world closer together than ever, but globalization also makes it easier for pandemics to spread unchecked. One of virologists’ greatest fears is a disease that makes people grow an additional arm that never stops making rude Italian gestures at Mob enforcers. Scientists hypothesize that in this scenario, mafiosi would kill everyone by staging suspicious accidents, then eventually turn on each other. The last human alive would be the don of the Gambino crime family, who would shoot himself while flicking his third arm at a mirror. 5. Nuking the San Andreas Fault causes too much gold to shoot out: If there’s any gold left in California, it’s buried deep below the San Andreas Fault. Government officials hope that detonating an atomic bomb in the exact center of the fault line will trigger an earthquake that blasts this gold to the surface, causing treasure to rain across L.A. and San Francisco. But if there’s more gold down there than we expect, it could potentially unleash a devastating hail of boulder-sized gold nuggets that will crush buildings around the world. Ultimately, though, we have to risk it if we want that gold. 6. The magnetic North Pole shows up at your house unannounced: Every few hundred thousand years, Earth’s magnetic poles flip, and we’re long overdue for a change. When that happens, Earth would be irradiated by cosmic beams, frying all electronics and giving everyone cancer. Worst of all, the magnetic North Pole would take years to head south to Antarctica, and on the way there, might choose to stop at your house for a while. It’s just going to be there, sitting on your couch, in your personal space— and remember that there’s no electronics anymore, so you can’t watch TV together. You’ll just have to endure an incredibly awkward silence. 7. Either the Necronomicon or a black hole: An ancient book written in blood on human skin that’s capable of unleashing the forces of Hell is just fantasy, right? Most scientists believe that the Necronomicon is unlikely to exist, but admit that black holes are frighteningly real. Even if the Necronomicon doesn’t get us, a black hole could, and if that happens, it’s game over for humanity.